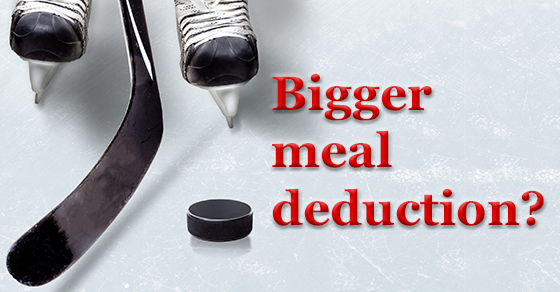 When businesses provide meals to their employees, generally their deduction is limited to 50%. But there are exceptions. One is if the meal qualifies as a de minimis fringe benefit under the Internal Revenue Code. A recent U.S. Tax Court ruling could ultimately mean that more employer-provided meals will be 100% deductible under this exception. The court found that the Boston Bruins hockey team’s pregame meals to players and personnel at out-of-town hotels qualified as a de minimis fringe benefit. Assuming that definition is met, employee meals generally constitute a de minimis fringe benefit if the following conditions also are met: 1. The eating facility is owned or leased by the employer. 2. The facility is operated by the employer. 3. The facility is located on or near the business premises of the employer. 4. The meals furnished at the facility are provided during, or immediately before or after, the employee’s workday. The meals generally also must be furnished for the convenience of the employer rather than primarily as a form of additional compensation.